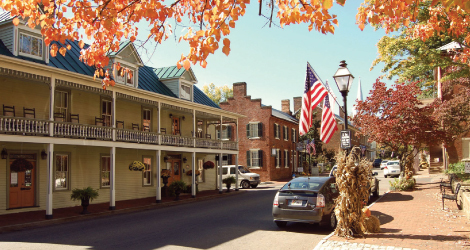 Jonesborough, Tennessee: Founded in 1779, long before Tennessee became a state, quiet little Jonesborough served as the capital of the geopolitical oddity known as the Lost State of Franklin, a territory along the North Carolina border that was organized as America's 14th state. It lasted from 1784 to 1788 but was never formally recognized by the union. Jonesborough is best enjoyed on foot, so park the car and stroll this historically rich town to appreciate the fine old houses and same westward-ho views that early pioneers took in. SHOP Local antique stores hold clues to the region’s colorful past. Start with a visit to Jonesborough Antique Mart for glassware, vintage silverware, and primitives, and then move on to Southern Exposure Antiques for toys, china, and retro duds. STAY A stop on the Tennessee Heritage Trail, the 14-room Historic Eureka Inn sits in the center of town. The 1797 structure has been restored and modernized, but the porch is still a great spot to sit a spell. Some 10,000 spectators and yarn spinners from every walk of life gather in Jonesborough each fall for the International Storytelling Festival, which has helped make the town the Storytelling Capital of the World. This year’s event takes place October 5-7. For details, visit storytellingcenter.net.